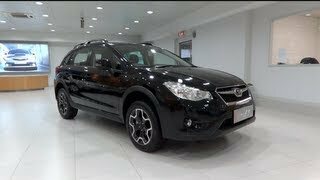 The Subaru XV 2012 is a new type of crossover SUV that not only projects a great presence despite its compact sporty design, but also boasts a range of new features never seen before in an SUV. While the proportions of the Subaru XV convey a sense of elegance and lightness, its exterior design combines high ground clearance, large tire wheels, and all of the other features one would normally expect to find in an SUV. 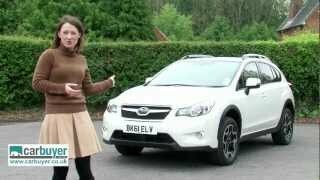 The Subaru XV is a new type of crossover SUV that not only projects a great presence despite its compact sporty design, but also boasts a range of new features never seen before in an SUV. While the proportions of the Subaru XV convey a sense of elegance and lightness, its exterior design combines high ground clearance, large tire wheels, and all of the other features one would normally expect to find in an SUV. What's more, superior drive performance and fuel efficiency made possible by Subaru next-generation power unit are joined here with the excellent maneuverability for which Subaru is renowned and an extremely high level of functionality. Thanks to the symmetrical All-Wheel-Drive and advanced Subaru Dynamic Chassis Control Concept - two core Subaru technologies - this vehicle feels incredibly safe and secure to drive. And as such, the new XV adds unique Subaru value to the ever-growing C-segment crossover market. Not only have Subaru made it possible to truly provide "safety and pleasure" as defined in our new brand statement, "Confidence in Motion," but in this new strategic model, it has been realized a unique Subaru persona—a persona that Subaru fully intends to further enhance going forward. Subaru is confident that the Subaru XV will thoroughly satisfy the needs of a diverse range of customers. The fundamental product concept that Subaru adopted for the Subaru XV can be expressed in two simple words - "Urban Adventure." In specific terms, a vehicle that would be perfectly suited to exciting, lively use in a city landscape. Thus, Subaru strove to optimally balance enhanced basic performance factors in the form of fuel efficiency and enjoyable driving (Fun to Drive) with a stylish, highly distinctive exterior design. As the Subaru crossover family continues to grow, the stylish Subaru XV is unique in the way it can be both sporty and casual. To this end, it boasts five key strengths. 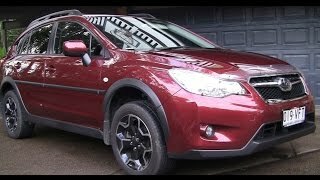 Sleek but muscular - Smart, powerful design: Subaru has given the Subaru XV a highly distinctive design that blends a uniquely Subaru profile with a sporty, energetic overall presence. Achieving both nimble drive and environmental friendliness: Notwithstanding its overall height, the Subaru XV feels extremely secure to drive, and thanks to a new engine and transmission that work hand in hand to make it more environmentally friendly, this SUV delivers a highly reliable ride that is uniquely Subaru. Safety performance of the highest standard: In addition to providing the driver with an excellent field of view, Subaru has applied our considerable expertise in the fields of collision avoidance performance and passenger protection performance. Spacious, relaxing cabin: the Subaru XV features an extremely roomy passenger compartment, a cargo area that is both spacious and convenient, and excellent riding comfort. Performance and equipment suited to urban life: Not only is this SUV remarkably easy to get in and out of, but it boasts an advanced, highly convenient information/entertainment system that supports the driver in a great many ways. 1.6i: When compared with the 1.5-liter engine in Subaru's current models, the newly developed 1.6-liter engine in this base model boosts output in all speed ranges while also realizing a much better balance between fuel efficiency and the thrill of rapid response to operation of the accelerator. 2.0i: In addition to being light on its feet, this model simultaneously delivers class-topping fuel efficiency and a luxurious ride. Meanwhile, it boasts a high level of torque in the low- to mid-speed range which is the most frequently used in everyday, practical situations. This base model has been equipped with a highly responsive engine capable of delivering a sensation of instant acceleration, even when the accelerator is only slightly depressed. 2.0D: Fitted with a horizontally-opposed diesel engine that is lightweight, compact, and uniquely Subaru, the 2.0D offers a high degree of torque even at low speeds and excellent response to operation of the accelerator. This base model also boasts excellent fuel efficiency with low CO2 emissions. An ample wheelbase was secured without having to increase the length of the vehicle. As a result of moving the A-pillars forward, the passenger compartment conveys a wonderful sense of spaciousness. The space gained from extending the wheelbase has been used to give more knee room to rear-seat occupants, who can now also place their feet inside the large open areas underneath the front seats. Thanks to these enhancements, the new Subaru XV has more rear-seat knee room than any other vehicle in its class. Naturally, this contributes to a higher level of comfort. Improvements to the internal structure of the doors enabled to increased space in the transverse direction inside the passenger compartment. With more shoulder and elbow room, the driver and passengers benefit from best-in-class spaciousness. The bottom edge of the A-pillars is also moved forward to accentuate the sense of space. In addition, the field of view has been made as unobstructed as possible by optimizing the cross-section of the pillar itself and providing triangular quarter glass in front of the rear-view mirrors. Meanwhile, the heater unit and ducts are also repositioned in the pursuit of a more roomy feeling interior, lowering the top of the instrument panel in the process. Gaps between the side sill and floor have also been closed. And higher seat positions that are more typical of an SUV also make it easier to get into and out of the vehicle. The floor of the cargo area and the internal structure of its roof feature a totally new design. By including a flat tire repair kit, it has been possible to secure ample distance from floor to roof. One half of the floor can be inclined by connecting its straps to specially provided hooks. As such, the size of the step at the opening can be reduced, and it is now much easier to get heavy objects, pets, and the like in and out. A 15-litre sub-trunk is also added (in models equipped with a flat tire repair kit). Making it much more convenient to store smaller items, this helps to keep the cargo area as roomy as possible. With level differences eliminated from the floor of the cargo area, loading and unloading has never been easier. Thanks to the adoption of this new design, Subaru XV owners will benefit from a greater level of convenience when shopping, when using the vehicle for sports and outdoor activities on holidays, and when traveling with pets. In order to ensure a comfortable ride regardless of where the occupant is sitting, the seats are developed to mold themselves better and more securely to the body. Front seats: With its higher hip point, the new front seat design makes driving much more enjoyable. What's more, the driver's seat comes with a six-way manual adjustable seat as standard. And not only can the headrests be raised and lowered, but they now also feature a tilt adjustment mechanism. Meanwhile, the back rests have been raised to provide more support at the top of the back. The adoption of flat-mat springs also contributes to a higher level of support. Tuning of the springs under the occupant has helped to improve the sensation of being securely held, and the sides have been reshaped to ensure that the seats do not feel cramped. A low resilience urethane have also been selected for the cushion sections to better hold the occupant's body and to absorb small vibrations produced while driving. 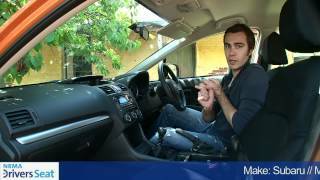 Rear seats: The rear seating area is much more spacious in the Subaru XV. Notable improvements in this regard are the concave surfaces at the back of the front seats and larger open areas underneath them, both of which make it easier for the rear-seat occupants to sit comfortably and relax. Meanwhile, the driver's field-of-view to the rear has been enhanced by the inclusion of retractable headrests. And with tether anchors for child seats built into the seat back, it is now much easier to load and unload the rear seats. The Subaru XV has been kitted out with a great many features suited to the urban lifestyle, typical examples of which being the advanced information/entertainment system and handy storage areas for all kinds of objects within arm's reach. In designing this vehicle, a high level of convenience for a diverse array of owners was one of our prime concerns. Thanks to a careful design approach that also took universal-design concepts into consideration, Subaru has achieved a vehicle that is extremely easy to get into and out of. Not only have Subaru made the door openings larger, but also raised the angle at the top of the front door sash, thereby providing more space between the sash top and body. Even when the doors cannot be fully opened, therefore, there is sufficient space for passage of the upper torso. In addition, the amount by which the legs must be lifted to get in and out has also been reduced for greater convenience. The distance between the floor and the top of the side sill has also been reduced, meaning that the driver and passengers do not have to stretch their legs as widely as before when getting in and out. And thanks also to the higher seat position, the overall design has been optimized to make vehicle access a much more stress-free experience for all types of user. With a focus on convenience, Subaru have provided ample storage space for small objects at ideal locations around the driver's seat. These spaces are suitably sized to accommodate wallets, cell phones, portable music players, and other items usually kept on the person; furthermore, it has also been provided holders for pens, cards, receipts, and the like inside the center-console box for added convenience. The compact navigation system of the Subaru XV boasts a high degree of connectability and compatibility with a range of digital media. Meanwhile, the "Multi-Function Display" (MFD) used to provide visual notification to the driver comes in both a Standard version and a High Grade version, which is equipped with a 4.3" color LCD. Coined from the terms "professional tool" and "trendy design," Subaru's "Protren" design concept symbolizes the fusion of SUV functionality and an urban persona. The Subaru XV features a new type of crossover design that combines a stylish, flowing form with a high body and side cladding that enhances the sense of security. Showing off the passenger compartment in all its glory, the elegant silhouette has been provided with creatively designed wheels, cut-away cladding, and many other features that suggest a fun-loving personality. As a result, an exterior appearance that is both sporty and attractive was designed. And thanks to the inclusion of characteristic touches from our other vehicles, such as the hexagonal grille and hawk eye-style headlights, the Subaru XV gives the impression of a next-generation crossover that is classically Subaru. The front grille features a hexagonal design - one of the hallmarks of Subaru vehicles. And thanks to its larger design and new plating, the grille not only allows the Subaru XV to look at home among the other models in our fleet, but it also gives a tangible impression of strength. With a bold look reminiscent of the eyes of a hawk, the headlights efficiently illuminate a wide area and boast a range of other functional improvements. The attractive design of the fog lamps allows them to blend seamlessly into the front bumper. The Subaru XV's innovatively designed aluminum wheels convey a real sense of depth while remaining fashionably urban. Thanks to the contrast between the silver spokes and black surrounds, the vehicle portrays a different impression when moving and when stopped. Instead of applying the distinctive side cladding all around as in the past, Subaru has made strategic omissions to enhance the sensation of dynamism and comfort of the Subaru XV. A new grain was also developed to enhance the effect of light and shadow. As a result, Subaru was able to create a sporty yet reliably safe impression, making the tires look larger than they actually are. The corners of the front and rear bumpers have been designed with special edges that enhance the aerodynamic performance of the vehicle. Naturally, this also contributes to better fuel efficiency. Instead of placing the turbo intercooler duct for diesel models inside an opening above the engine, it has been neatly integrated under the hood. In developing the Subaru XV passenger compartment, our goals were to realize a relaxing space that conveys a comfortable sense of spaciousness and quality of material. Together with a luxurious interior that perfectly balances the different tactile and emotional qualities of leather, metal, and cloth, Subaru has adopted an instrument panel design that accentuates the horizontal in order to convey a sense of space in all four directions, thereby creating an aura of tangible quality. Multi-Function Display (MFD) Coming in either a Standard or High-Grade version, the Multi-Function Display (MFD) is highly visible in the upper middle section of the instrument panel. Hoping to encourage Subaru XV owners to integrate better with their vehicle and take pleasure from eco-friendly driving practices, the display content was designed with the Urban Adventure concept firmly in mind. The standard MFD provides the driver and passengers with information necessary for practical driving—such as outside air temperature, time, and the like—in a highly intuitive format. For example, the fuel efficiency indicator can show real-time efficiency, average efficiency, or continuous travel distance, and it can also be blanked out; furthermore, as the MFD can also notify of continuous travel time and average vehicle speed, it provides the driver with extensive support in terms of safe, economic driving. On vehicles equipped with an auto start stop system, meanwhile, the display shows engine-stopped time and cumulative stop times (both total and this trip). Sporting a large 4.3" full-color LCD, the High-Grade MFD not only caters for practical driving situations, but also boasts a wide range of functions that support more intelligent driving. In terms of eco-friendly driving, the High-Grade MFD goes far beyond just indicating fuel efficiency; instead, its Eco-driving display helps the driver to improve fuel efficiency using six different tools, such as the Eco-gauge and Eco-value screens. Other content for vehicles with an auto start-stop system indicates the stop times and the amount of fuel saved. In these and other ways, the Eco-driving display provides the driver with a visual representation of his or her eco-friendly driving. Whenever necessary, the MFD provides the driver with pop-up notification of important information such as the continuous drive time, environmental factors such as outside air temperature or road surface conditions in the cold, and the status of the vehicle's various systems. Meanwhile, if a problem is identified in any of those systems, the driver is notified using both pop-up notification and warning lamps in the instrument cluster. Video from a rear view camera can also be shown on the MFD to further enhance safety and convenience. Combination meter There are two versions: top-grade and standard models. Illumination on the top-grade model is white; on the standard model, it is red. A relief design has been realized by using metallic ring accents; meanwhile, the use of metallic-finish rings enhances the overall air of quality. The gauges have a sweep function in which the indicators move to the maximum position when the ignition key is turned to ON and then quickly return in order to heighten the excitement of driving. In the center of the cluster is a large LCD monitor that provides the information most crucial to driving: current gear, fuel gauge, etc. All the most important information can be obtained with just a glance at the center of the instrument cluster while driving, which allows the driver to concentrate even more fully on driving. The leather-wrapped steering wheel gives a feeling of opulence, and includes a decorative silver bezel. The urethane-covered wheel suggests sporty-impression with an improved tactile surface with the use of soft-feeling material. The steering wheel has switches for MFD, audio, and cruise control. In addition, the sizes and shapes of switches are reworked for greater operability. For the Lineartronic, the compact paddle shifter fixed to the steering wheel is equipped as standard. While operability during driving is enhanced and manual-shift driving can be enjoyed, parts around the steering wheel are neatly designed. Silver paint has been applied to enhance the luxurious feel. The shifter handle has a luxurious appearance thanks to the addition of leather, a decorative silver metallic panel, and a metallic cover. The design of the grip shape is easy to grab, whether gripped from the top or side. In conjunction with the handle positioning, the layout of the path that the gear shifter moves along has been optimized. A sporty grip is equipped for six-speed/five-speed manual transmission. For the top grade, a leather covered grip can choose. Including the new body colour "Tangerine Orange Pearl", ten colour selections are provided: Tangerine Orange Pearl,Ice Silver Metallic, Satin White Pearl, Dark Gray Metallic, Obsidian Black Pearl, Camellia Red Pearl, Sky Blue Metallic, Deep Cherry Pearl, Marine Blue Pearl, Sage Green Metallic. For the first time in 21 years, Subaru has developed a new engine to replace the "EJ" engine currently used in all Subaru passenger vehicle lines. Developed in response to heightened demand for environmentally-friendly functionality, this new "FB" engine retains the proven benefits of the horizontally-opposed engine while "enhancing fuel efficiency," and "delivering performance better tuned to practical use, with a focus on torque in the low- and mid-speed ranges." This core engine marks the beginning of a new era for Subaru. 1.6-litre and 2.0-litre engines are available for the European market. Both engines employ nearly the same devices except for the engine blocks, which helped to succeed in balancing fuel efficiency and output performance. 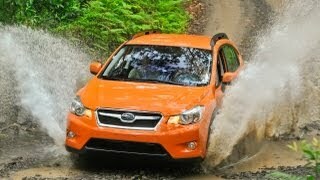 The SUBARU BOXER DIESEL, which was specially developed for the European market, received very favorable reviews. Its high rigidity, high-degree of smoothness, lightweight, compact design, excellent acceleration response with a high level of torque even at low speeds, lower CO2 emissions and better fuel efficiency are among the most frequently cited benefits. The all-new Subaru XV includes this Boxer Diesel in the line-up to meet the strong demand from customers concerned with environmental friendliness. Two types of centre differential mechanisms, a core of AWD, are provided according to the transmission type. Irrespective of the driver's level of expertise or skill, Subaru's unique AWD system allows the benefits of all-wheel drive to be utilized to their maximum potential and with a high level of safety. Subaru's electronically controlled all-wheel drive system integrates a MP-T (Multi-plate transfer (multi-plate clutch)) into the transfer used to distribute torque to the rear wheels. Operating based on a 60:40 (front:rear) torque distribution pattern, the transmission control unit responds to driving conditions such as acceleration, climbing, and turning in order to adjust the front-rear torque distribution in real time. Whenever slipping of the front wheels is detected, the system increases the amount of torque being distributed to the rear wheels, thus ensuring sufficient traction. The system is a combination of the bevel-gear-type centre differential with the basic torque distributions of 50:50 and the viscous coupling for limited slip differential. When the front wheel or rear wheel slips, the viscous coupling corrects the torque distributions to ensure traction. Centre differential AWD with viscous LSD is combined with the 5-speed and 6-speed manual transmission.